Online social network Multiply has closed a Series A funding round with $5 million from Transcosmos and $1 million from the company’s founders. 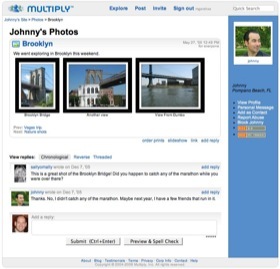 Multiply is a service that filters all networking functions, from highlighted users to visible tag clouds, through a proximity filter with a slider. In other words, users determine whether they want to view information about people just on their contacts list, who are friends of a friend, etc. As new social networking sites go, I’d say this one has pretty fair odds of surviving. Since launching in March 2004, the system has nearly 3 million registered users and recently expanded with a localized version for Japan. The company says it will use the new funds to expand features, functionality, marketing and international presence. With so many social networking sites on the web, marketing is going to be essential. Founder and President Peter Pezaris was previously CBS SportsLine.com’s President of Operations and Product Development and oversaw operations of nfl.com, pgatour.com and cbs.sportsline.com. Transcosmos adds Multiply to a portfolio that includes Ask/Bloglines, RealNetworks, Hipcast/Audioblog, Pheedo, Edgio and others. Multiply aims to be distinct by focusing closely on limiting interactions to people who are already connected to each other. Beyond that, though, the system has a number of interesting features like Ajax message boards and a forum organized by user attention in addition to thread update currency. The message boards display new comments on the screen of each party in a conversation in near real time and the forum will prioritize threads by whether a user has read them before – so a thread isn’t brought to the top of your view of the forum just because one of only two people who care about it has made a new post. There’s RSS all over the site and it’s got a nice feel to it. If the new funding gets leveraged well, Multiply may be able to grab a bigger piece of the social networking pie.